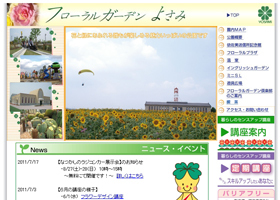 The Floral Garden Yosami & Yosami Radio Transmitting Station Memorial Museum was built in April 2007 next to the site of the original Yosami Radio Transmitting Station by the City of Kariya. While the Station was expected to preserve, as industrial heritage, the Station buildings are demolished in 2006. The office building of the Floral Garden Yosami took the image of the original Station office building, and the Yosami Radio Transmitting Station Memorial Museum in the Garden houses its VLF transmitting equipment for wireless communications between Japan and Europe to display. In the Floral Garden Yosami, the 25-meter high Yosami Memorial Antenna Tower, one-tenth of the original height, built in 1999, 250-long Mini Steam Locomotive Trail in memory of the temporary 2.4km rail laid from Ogakie station on Mikawa Railway Company are some of attractions. English garden, Civic gardens, Japanese plum “ume” garden, Ponds, Playground, Lawn ground, Cherry blossom tree row, Jogging course, parking lots are arranged. The Temple Bell of Peace was hung at the precinct of the Gangyoji Temple in Hajodo-cho in March 1999. 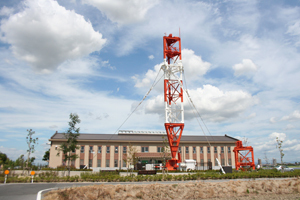 The Bell was made by 108 tons of the earth wires laid under the Yosami Radio Transmitting Station. The Bell prays for peace after the military use of the Station during war times.